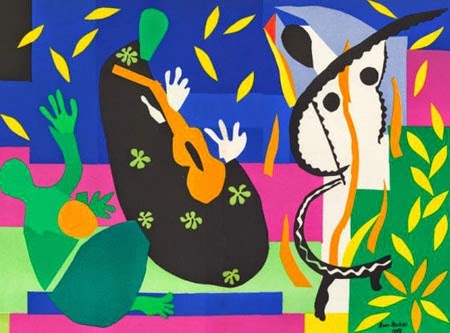 A major exhibition of Henri Matisse's cut-outs is now in London at the Tate Modern and will be traveling to the Museum of Modern Art on October 25, 2014 (through February 8, 2015). Until fairly recently, this late work of Matisse's, like the late work of Monet and Picasso (and I believe De Kooning can be added to the list), was wrongly belittled as the frivolous art of an old man. 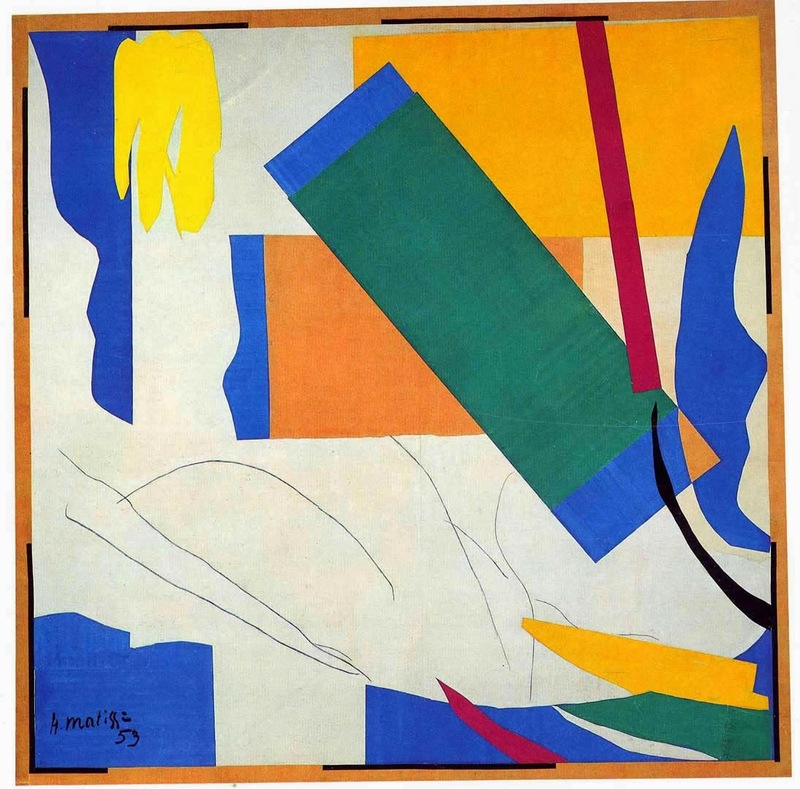 I've long believed, however, that Matisse's innovations are similar to, and at least as radical as, what the Abstract Expressionists were doing at the time; and that Matisse's cut-outs should be considered among the greatest work of the twentieth century. They certainly are among the most joyful art ever made. 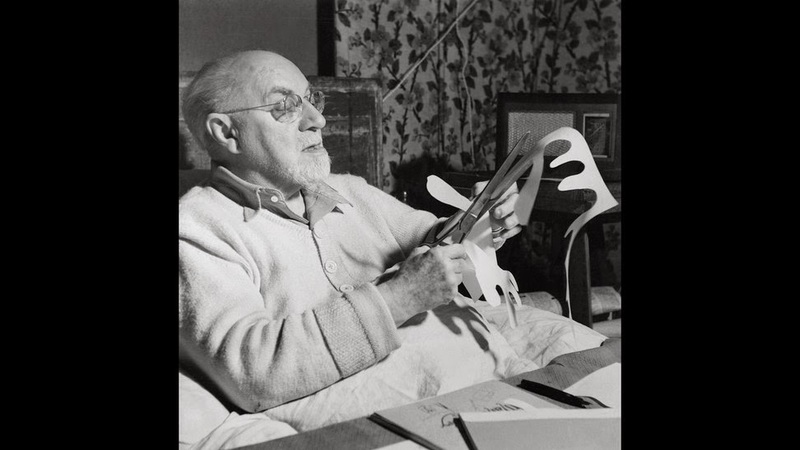 Matisse working on a cut-out in his studio in Vence, 1947 (Financial Times). 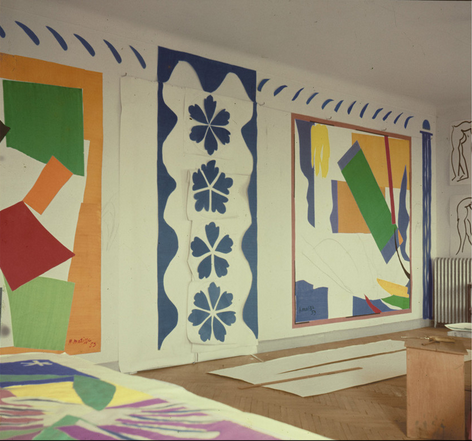 Matisse's studio, The Snail, 1953 on the left and Memories of Oceania, 1953 on the right, with a section of Large Composition with Masks, 1953, in the center. Shapes drift from one cut-out to another – e.g., a negative cut-out (the part of the paper left over) might be incorporated into an adjacent work – and colors harmonize and interact among works. Matisse's environments are more palpable and immediate than any room decorations of the past. Rooms painted by Fragonard in the 18th century, for example, are imaginary worlds set in a space behind the frame – a different space from our own. We look through the picture plane at a fantasy world. With Matisse's cut-outs, the viewer becomes a participant in a "real world" experience. 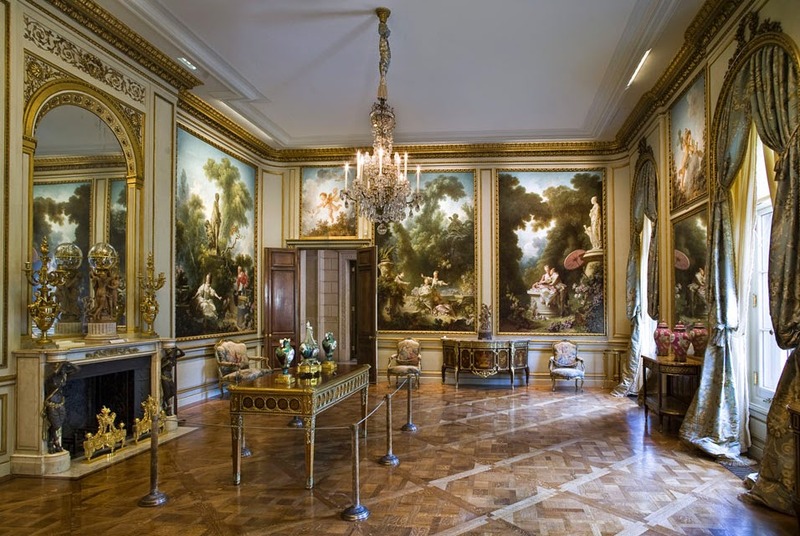 The Fragonard Room, The Frick Collection. Photographs taken of Matisse's bedroom/studio show it filled floor to ceiling with cut-outs which sometimes even spilled out onto the floor. (In the photo below, the cut-out La Négresse, on the far right, has a foot on the ground.) The cut-outs are so physically present that even what little illusionistic space that exists becomes a "real" thing that begins at the wall and advances into your "real" space. Henri Matisse in his studio in Nice, 1952 (photograph: Lydia Delectorskaya © Succession Henri Matisse). 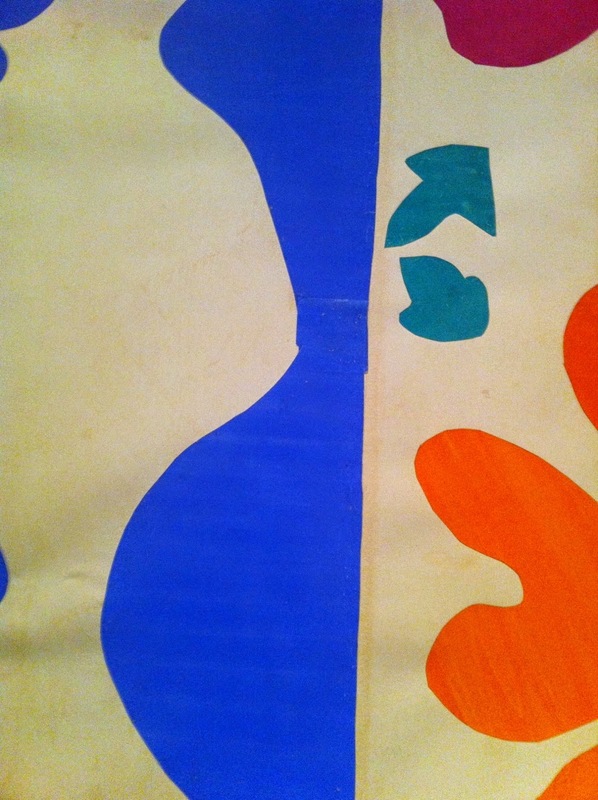 As Matisse worked, the cut-out pieces of paper were pinned to the wall of the studio so they could be easily adjusted. (Tate conservators detected more than a thousand tiny pin holes in some of the cut-outs.) These pieces of colored paper would curl up and sometimes flutter in a draft; as a result, they would have had even more depth, animation and physical presence than finished, flattened work. 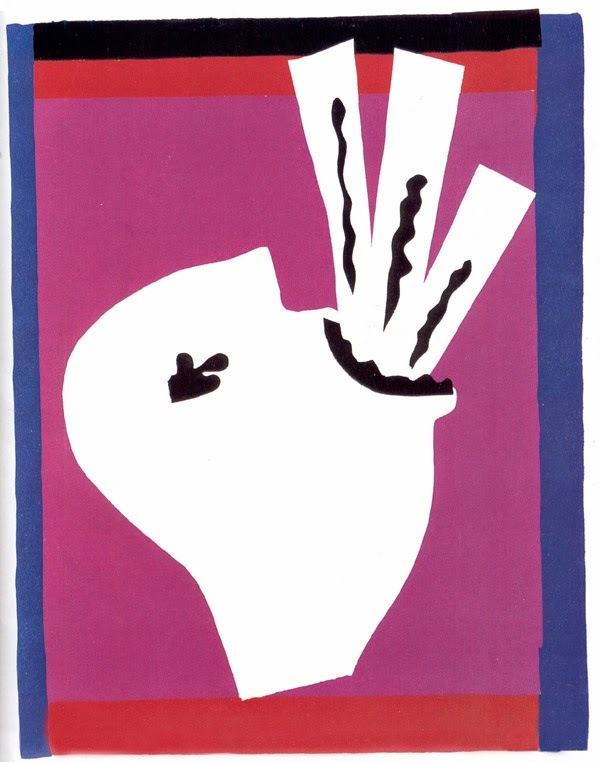 Henri Matisse, The Sword Swallower, from the Jazz suite, 1947, stencil, planographic color stencil, printed from multiple cut paper stencils, lithograph, edition of 250, 15 3/4 x 11 3/4 inches (National Gallery, Washington). The spontaneous, casual, handmade quality of the cut-outs, all but lost in reproduction, is perhaps even more important. As with Mondrian's paintings, little imperfections make it viscerally obvious that the art is made by a human being. 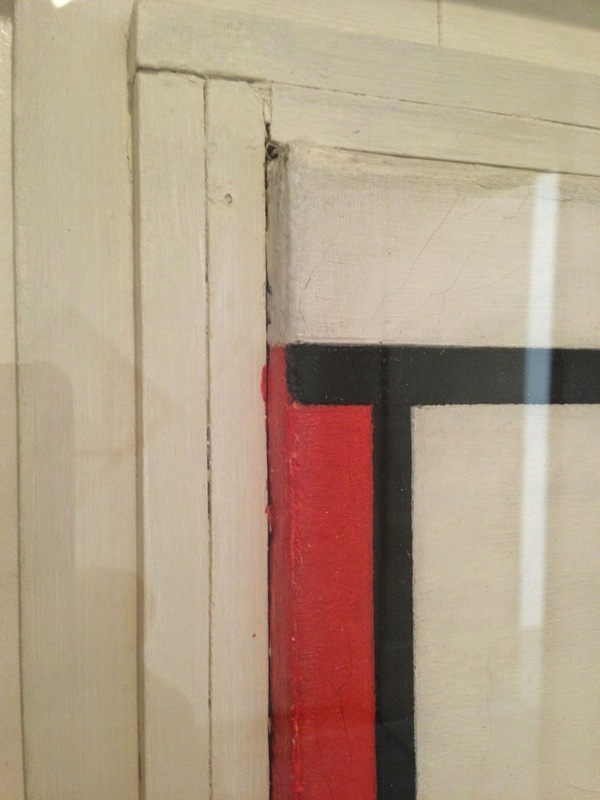 Detail - Piet Mondrian, Composition with White and Red, 1936, oil on canvas (Philadelphia Museum of Art, 1952-61-89). Close-up detail of Henri Matisse, Large Composition with Masks (National Gallery of Art, Washington). 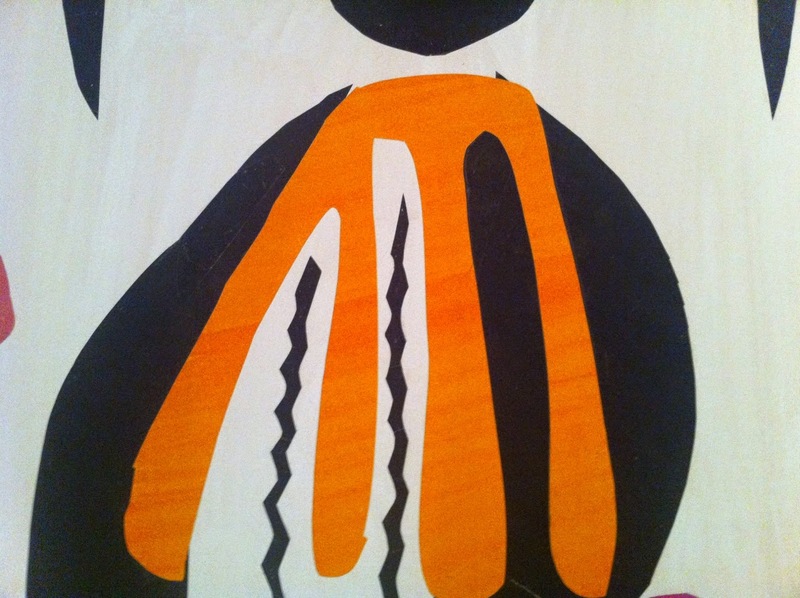 Close-up detail of Henri Matisse, La Negresse, 1952-53 (National Gallery of Art, Washington). Matisse probably became attracted to at the idea of making environmental installations from his experience designing the Dominican Chapel of the Rosary in Vence, usually known as the Matisse Chapel. Interior of the Matisse Chapel. In 1946, Sister Jacques-Marie, a young nun who helped Matisse convalesce after serious intestinal surgery, asked him if he would advise on the design of a stained glass window for a new chapel. Not only did he, an avowed atheist, agree, but, at age 77 and still weak from his surgery, Matisse took on the design of the entire chapel including the architecture, stained glass windows, interior furnishings, murals, and the vestments of the priests; and he even raised funds for the chapel. My only religion is the love of the work to be created, the love of creation, and great sincerity. I did the Chapel with the sole intension of expressing myself profoundly. It gave me the opportunity to express myself in a totality of form and color. And it was a "totality of form and color" indeed. Matisse converted his entire studio into a mock-up of the chapel so he could more easily work on the designs – literally surrounding himself with his art. 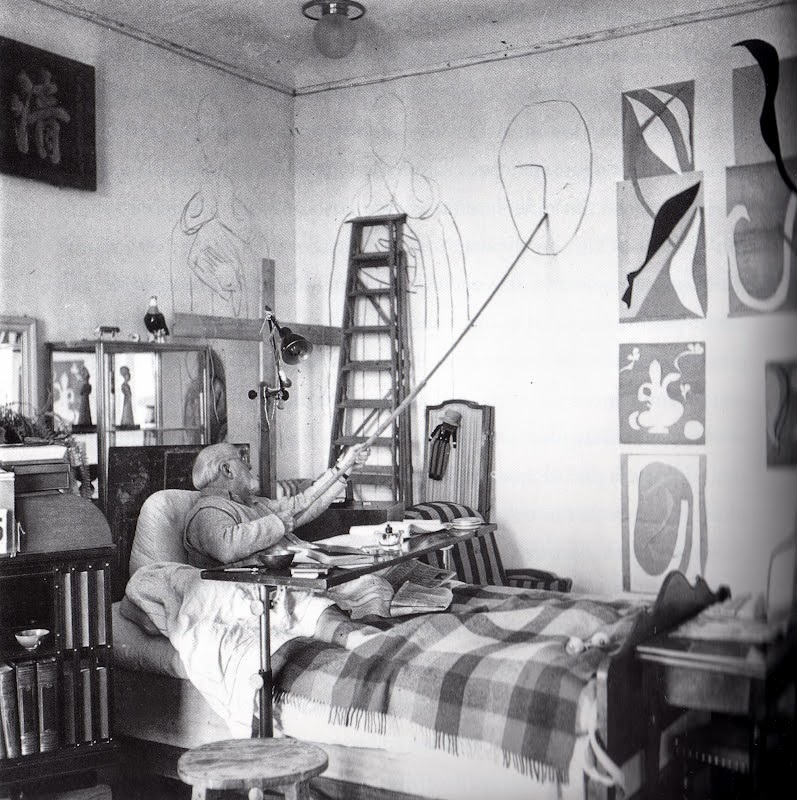 Matisse drawing a head for the decoration of Chapelle du Rosaire in Vence (The Matisse Chapel) in his studio/room in the Hotel Regina, in Nice-Cimiez, 1950. 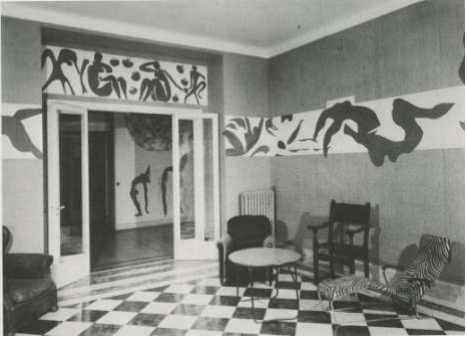 The National Gallery's Matisse Room was the only place one could experience a room of Matisse's cut-outs close to the way he arranged them in his studio. Unfortunately, the entire East Wing of the National Gallery, including the room with the Matisse cut-outs, is closed for renovation and won't open until sometime in 2017. For some reason, the National Gallery doesn't even have reproductions of these cut-outs on their website – but I managed to download this one from the Arts Observer website. Installation view, Henri Matisse, La Négresse and Large Composition with Masks in the National Gallery of Art, Washington. View of The Swimming Pool in the dining room of Matisse’s apartment at the Hôtel Régina, Nice, c.1952. Women and Monkeys can be seen above the entryway. 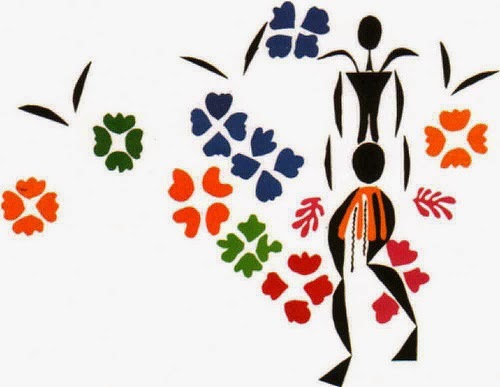 Acrobats and a preliminary drawing for Rose Chasuble can be seen through the entryway (photo from John Elderfield, The Cut-Outs of Henri Matisse, 1978, p.119). However, with the completion of an expensive multi-year restoration and conservation, The Swimming Pool is finally on view again, and, at a staggering 70 feet wide, it is one of the stars of the Tate/MoMA exhibition. 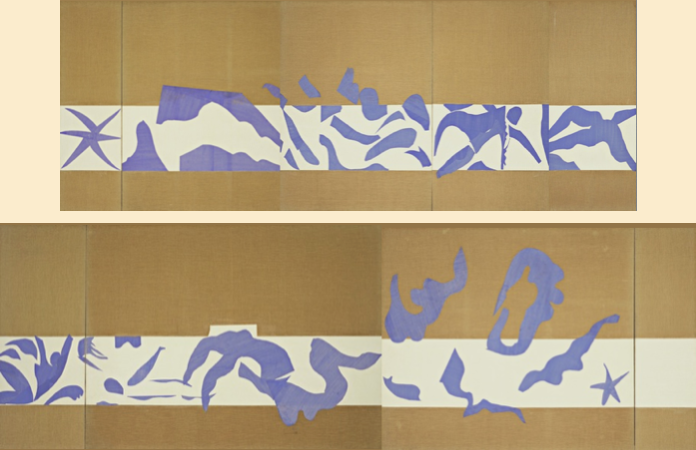 Henri Matisse, The Swimming Pool (left portion on top, right on the bottom), 1952, gouache on cut paper, overall 73 inches high x 70 feet wide, installed as nine panels on burlap-covered walls, 11 feet 4 inches high (MoMA). Henri Matisse, Women with Monkeys, 1952, gouache on cut paper on white paper, 28 1/4 x 112 2/3 inches (Museum Ludwig). Henri Matisse, The Snail, 1953, gouache, 113 x 113 inches (Tate Gallery, London). Henri Matisse, Memory of Oceania, 1953, gouache on paper, 112 x 109 inches (MoMA, NY). 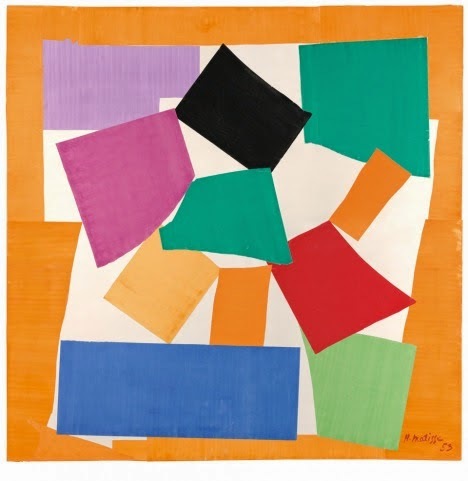 Henri Matisse, La Négresse, 1952, paper collage on canvas, overall 178 11/16 x 245 3/8 inches (National Gallery of Art, Washington, Ailsa Mellon Bruce Fund 1973.6). 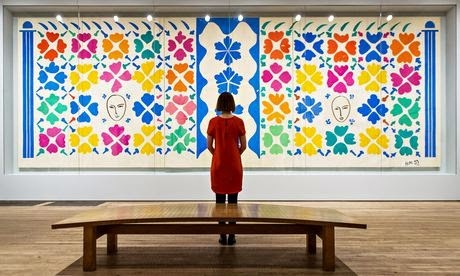 Henri Matisse, Large Composition with Masks, 1953, gouache on paper, cut and pasted on white paper, mounted on canvas, overall (five joined panels) 139 3/16 x 392 5/16 inches (National Gallery of Art, Washington, Ailsa Mellon Bruce Fund 1973.17.1). Henri Matisse, Sorrow of the King, 1952, gouache on paper cut and pasted, 115 in × 152 inches (Musée Nazional d'Art Moderne, Centre Georges Pompidou, Paris). * Although these quotes are cited in many different places, I have not been able to discover the original source for any of them. 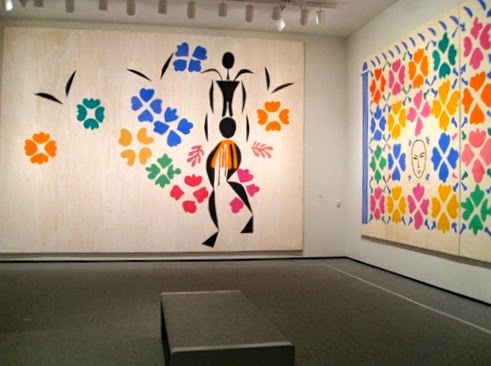 There was a huge show of Matisse's cut outs at the National Gallery in DC in 1977. Though they are amazing and a testament to how art can be an opening with age I would not say their achievement is comparable to the abstract expressionists. They broke through to a deeper terrain than Matisse had ever ventured into. And this is not to posit joy against terror. I think late Bonnard might be comparable to the NY School in how much he changed the gyre of painting, matching late Monet. This is interesting. How do you think Bonnard changed painting? I never realized how many talented people there were, and talented 4 year olds! But seriously, this is a good and comprehensive article. I will be takin gmy daughter Rhapsody to this one in the fall! I've always been drawn to his cutouts. They bring me joy! With a name like Rhapsody, she has got to love it! I'm with you on the historical significance of the cutouts and the masterpiece status of the Chapel. Regarding the latter, we've got two other candidates for that status, Picasso's "Guernica" and Duchamp's "Large Glass," both self-consciously conceived as "masterpieces" and both generally regarded as such in the literature. But both are flawed, the Picasso in that his reach exceeded his grasp--the "Weeping Women" he did at the same time and after completing the mural are far superior--and the Duchamp insofar as it's reactionary, its glass support longing for the illusionist paradigm that no longer guided the art of painting. 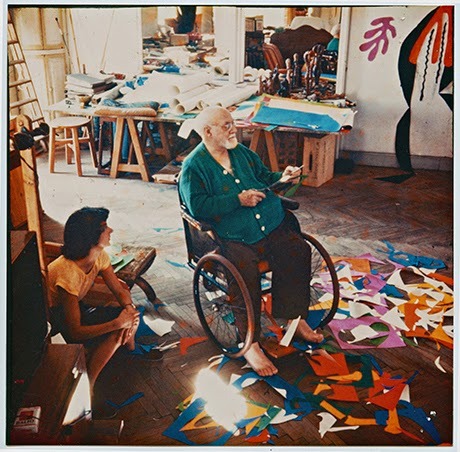 Together, those two efforts reinforce the thesis that masterpieces are foreign to modern artistic practice, and Matisse's chapel is the exception that proves the rule: It wasn't conceived as an art masterpiece, it was conceived as a gesture of gratitude to the caregiver who enabled him to recover and continue working. You are so right Carl. Matisse talked a lot about sincerity as he got older. That's might be the difference between his masterpiece and theirs. Erik - I'm using Google Blogger which gives you a choice of different sized reproductions. I just click on the uploaded photo and a menu comes up. Captions can be added that way too. I don't know about Wordpress but it's supposed to be pretty good and almost certainly provides that option. I prefer his cut outs to his paintings, by far. His paintings had uncomfortable atmospherics from streaky colors and uncertain lines. Pure form and color was realized in his cut outs. Yes, they could be called flat and decorative - but what decoration! But what's wrong with streaky? As I wrote in the post, it makes the work feel handmade and human. Besides, the close up details of cut-outs show they have "streaky colors" and "uncertain lines." I remember the first time I saw a Mondrian in person and was surprised and disappointed by what I thought of as imperfections. I've grown to treasure them now -- it makes his paintings so touchingly human.